New inspiring find every Wednesday. Make sure to watch this space each week as this content will be taken down at the end of the month and you won’t want to miss it! Want your organs to function better for overall health? Breathing can make a huge difference. This is a cute 3-minute video with a serious message about the breath. The 1:50-minute mark is where he talks about yogic breathing if you would like to skip the first part. What stress has to do with our breath. Understand why our stress response has a negative impact on our breath. The basics of how our breath stimulates our parasympathetic nervous system. If you want to be led through a stress-reducing 3-minute breathing training with Dr. Andrew Weil, check out my mini training this month! This is a wonderful and very short animation about the breath showing the muscles, bones, and organs that are also involved when we breathe three-dimensionally. You can see the lateral expansion a high-quality breath creates. Do you get the feeling when watching this of how beneficial this type of breath is? How it creates internal massage through breath? I do, and I love it! We hear about inflammation causing so many issues in our bodies. Well, one way to help with inflammation is to stimulate the Vagus nerve by using the full function of your diaphragm to BREATHE. Take a look at this minute in a half video that will introduce you to your Vagus nerve. If you take my classes, you’ve heard me mention the Vagus nerve and the importance of this nerve to our general well being. Perhaps this video will be one of the most important introductions you will have in your life. One way to stimulate the vagus nerve is to BREATHE with an effort to use the full range of motion of your diaphragm. 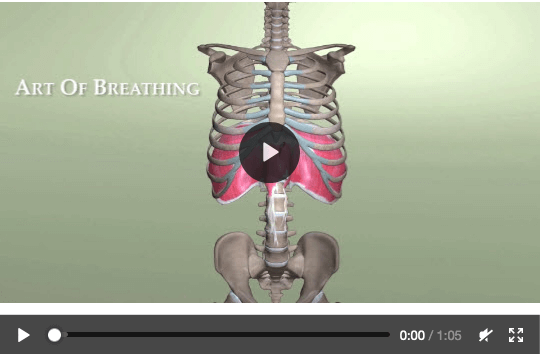 Check out my mini training this month that will show you a visual of full belly breathing. Coming the 4th Wednesday in April! Sign up for my quick inspirations (one cue, tip, song, and quote) you can use in class each week and/or my monthly playlist. © 2019 Pamela Udell - All rights reserved. Enter your name and email address and receive my free PDF! * You will also receive my quick and inspiring newsletters each week. You can unsubscribe at any time. Get out of your rut and inspire yourself and your classes! I will share inspirations and favorite finds that I don’t share anywhere else. And if you’re not in a rut, you will still grow as a teacher…no mater how long you’ve been teaching. * You will also receive my quick and inspiring newsletters twice a month. You can unsubscribe at any time. Find more confidence in your crow pose in 6 days! Learn new alignment cues and tips to help your crow pose soar! Gain more strength and stability even if you already practice crow pose.